With so many options for residential energy improvements, how does a homeowner begin? Efficiency Maine can help! There is a wealth of energy efficiency information on Efficiency Maine’s website. Visitors can find energy tips, heat pump user tips, weatherization, heating, water heating, and financing information. It’s easy to find what steps Mainers need to complete to get their project started and what rebates are currently available for home energy efficiency projects. Visit efficiencymaine.com today and make your home comfortable year around. Keep reading for more information on the resources available on the efficiencymaine.com website. Once you’ve decided WHAT to do to improve your home’s energy efficiency, you face the challenge of finding WHO can do the work. Fortunately, Efficiency Maine has made that second step easy—by offering an online “Vendor Locator” search tool: www.efficiencymaine.com/at-home/vendor-locator/. 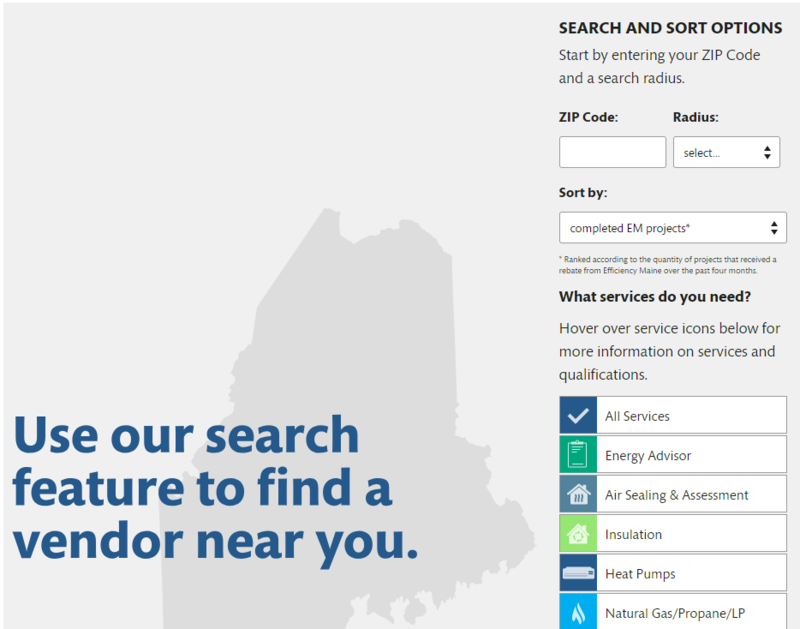 This page of the Efficiency Maine website gets a lot of traffic—as homeowners use it to locate a wide range of energy efficiency and renewable energy contractors, from companies doing energy audits to those installing heat pumps. Close to 800 companies are included statewide. The Vendor Locator page offers an introductory video but using the search tool is easy. Simply type in your zip code and preferred geographic radius and then click on the services that you need (e.g., insulation or pellet/wood stoves). You’ll get contact information for firms—with symbols denoting which of the needed services they provide. Registered Vendors on this website are independent of Efficiency Maine. Efficiency Maine does not endorse or recommend any particular service provider. Matters of project contracting and performance are between the customer and selected service provider.